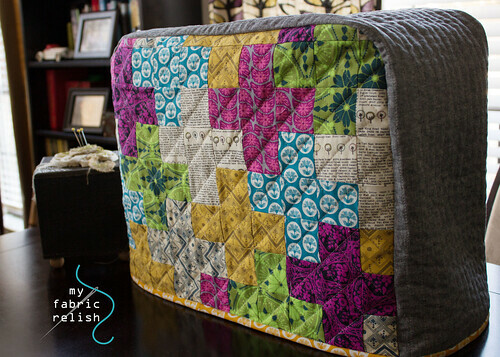 my fabric relish: Happy Birthday, my fabric relish! 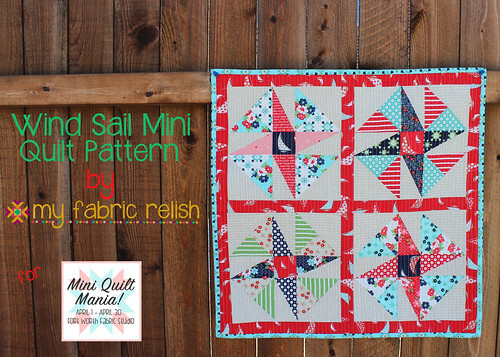 Happy Birthday, my fabric relish! Yep, that's a Juki! TL 2010 to be exact. And she is my new bff! 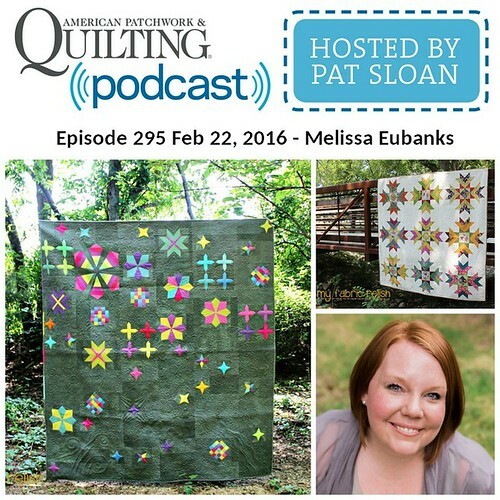 She sews like a dream and fast as all get out! I had been saving for this machine for a few months and asked for only Amazon gift cards for Christmas to go towards it. Mr. Relish wanted me to wait until we move (we hope to move this spring and another story for another day!) and while that would make sense to most, it made absolutely no sense to me! So the day after Christmas when I was still debating which machine I wanted (it was between this Bother, this Juki and then the Juki I chose) and tallying my Amazon gift cards, Mr. Relish told me to just go ahead and get it. And so I did! Isn't he fantastic! 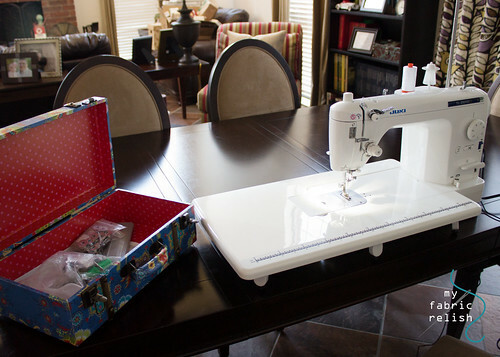 Unfortunately, there isn't room in my 1/2 room sewing space for her now, but she is happy on the formal dinning room table, which is only used twice a year for Thanksgiving dinner and then to wrap Christmas gifts. At least for right now, I think this is a great space since I will mostly use her to quilt and would need clear space anyway. As I briefly mentioned above, we do plan on putting our house on the market soon and knew I couldn't just have her out in all her glory, so I made her a pretty new dress. I really had made the panel as a 24 x 24 plus block pillow but decided it would look better as a cover and cut off several inches on the bottom then used that as the pocket for the other side. I basically just used the cover that came with the machine to make the new cover and added a 1/2 inch seam allowance. So in a nutshell, it is two 15 1/4 x 19 1/4 panels with rounded corners at the top and then one long 10 x 47 1/4 inch panel. I lined them with cotton batting and muslin on the inside. I serged the inside as well to keep it from fraying. I hand drew the embroidery design on the cover and stitched with perle cotton. It was my first time using perle and really enjoyed not having to separate the threads! I scanned my embroidery design in case anyone would like to use it and not comfortable with drawing it. You can download it here. I added the binding just as I do to my quilts. 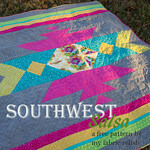 I used Anna Maria Horner's True Colors with some Road 15 text print mixed in and then of course some Black Essex Linen! 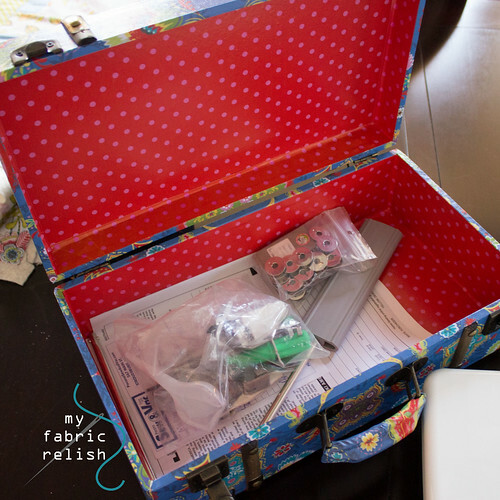 I found this cute little decoupage suit case a hobby lobby to house all the tools and feet that go with the machine. I also found a black little box to use a my little trash/thread catcher (see a few pictures above). Potential buyers won't be the wiser! Congratulations on your new BFF and I love the cover as well. You so deserve that lovely machine...She is a beauty! Congrats on one year! I look forward to many more!! Congrats....and I love your machine cover!! Congrats on the one year and the new machine!! Congratulations on your first blogiversary! The machine is gorgeous, and so is the cover! I'm gonna start saving for that machine too. I've been eyeing it for the last six months, at least. Let's see, I have 7 more months to wait for my first blogiversary, but I'm going to do it too! I can't wait to see what you make with the juki and hear your review. Happy 1 Year Blog Birthday!!! Congrats on the new machine, she is beautiful! 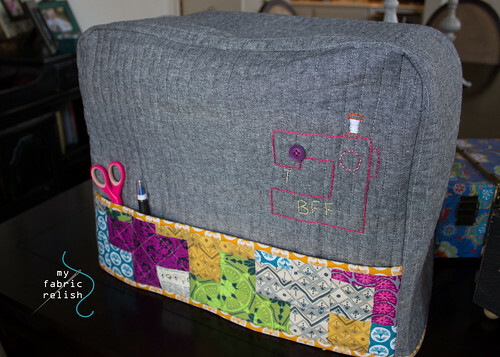 I adore the BFF stitching on the machine embroidery! What a great idea! Happy bloggy birthday to you and a warm welcome to your new machine! Not sure which I love most, the machine or the cover! Enjoy them both. Happy blog birthday. What a fab birthday gift, and how finely dressed she is. Congrats. So exciting to have a new fabulous machine! Your cover is lovely. What a great year your blog has had - happy blogiversary! That cover looks just awesome for your new machine - I love both sides. The back pocket is just wonderful! That is such a cute sewing machine dress! Happy Blogiversary. I got my juki about 9 months ago and I couldn't be happier. Hopefully you'll like yours as much as I do. Congrats on your blogoversary! And I love you machine cover. I definitely see myself making one very soon!! Happy Birthday, Dear Blog! I love your suitcase...may have to go to Hobby Lobby and check it out! Thanks for the chance to win! Happy Birthday. Thanks for the chance to win. Love the cover for your machine. I love your machine cover! 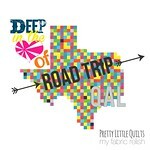 I'm not in the US but I would love to gift this to a quilting friend! Ooh! I love the idea of giving your blog a present!! Great gift, too! Happy birthday Blog and congrats on the new BFF! I'm so glad to add your name to the short list of women I 'know' who really know how to celebrate themselves!!! What a wonderful machine, and I am sure you are going to be happy every time you use it (or even look at it!) in years to come. Good luck with your anticipated move. Also, I notice that you changed your picture to the one that your daughter took of you. I like it! HELLO! CONGRATS>1 YEAR! CONGRATS ON YOUR JUKI! ooo please count me in! congrats on the Juki! I can't wait to see what you create with it! Congratulations on your first year anniversary and on the wonderful Christmas gift. 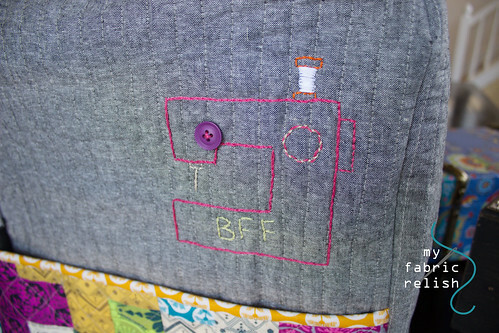 I love machine cover especially the way you embroidered "BFF" on it. W.I.P. W.I.P. hooray! Congratulations on your blogaversary. My first year blogging is also coming up next week! I adore your blog, please keep going for many many years! Yes. You do have a special post today! Happy Birthday to The Fabric Relish! Wow-You have come a long way in one year! Congratulations! Love everything about your blog! 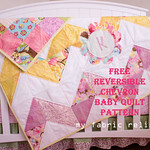 Great content, sewing style, writing, pictures. It is a very nice place to visit! And.. Congratulations on your new sewing machine! Very pretty cover! That is sure to help get a nice offer on your house! So jealous of your new BFF. She's beautiful and her cover is fabulous! Yay, happy birthday. I can tell that you're going to have many hours of happy sewing. Congrats on your blogaversary and on your Juki! I love the dress and all the accessories you added to make Juki feel welcome in the dining room! Love your new bff's clothing! Oh my goodness! Congrats!! That is so exciting! I've been eyeing that machine too! It's a beauty! I'm so excited for you! I have yet to make a sewing machine cover. Yours is so cute and I love the outside pocket on the front. Yeah, for Pink Castle; I like them, too. That is one beautiful machine, and your new "dress" is really great. I need to make a new dress for my old Featherweight, and yours in inspiring me. Congratulations on your new acquisition, and I'm glad to hear you're using your dining table for large projects. No need to keep an entire room just for a couple of times a year! I, too, use our large dining table for all kinds of project that need some open, flat space - it's wonderful! Happy Birthday to your blog - I sure do enjoy your posts! Congrats! I love your dress for your Juki, you are so creative! Congrats! Your machine cover is really pretty! I love the pocket and the embroidery touches! Congrats on your new best friend!!! She's a beauty, no doubt :) So, what's her name??? She is certainly sporting a beautiful dress - love it! Your embroidery really adds the perfect touch. Perfect gift for your blog's first birthday! I've enjoyed following your blog for quite a while now and thoroughly enjoy it. It's always a good day when you have a lovely machine like that! Happy birthday! Your machine cover is great. Thanks for being so generous with the giveaway. Congrats on the birthday! What a great machine and the cover you made is, is just over the top. Thanks for holding the giveaway. Whoa, look at the size of that bed! Fun! Love the cover, too! Your cover is so cute!! Love the embroidered sewing machine. What a cute cover. Happy Birthday! I LOVE your new sewing machine cover. Congrats on the machine. I just found your blog, I can't wait to read through it. 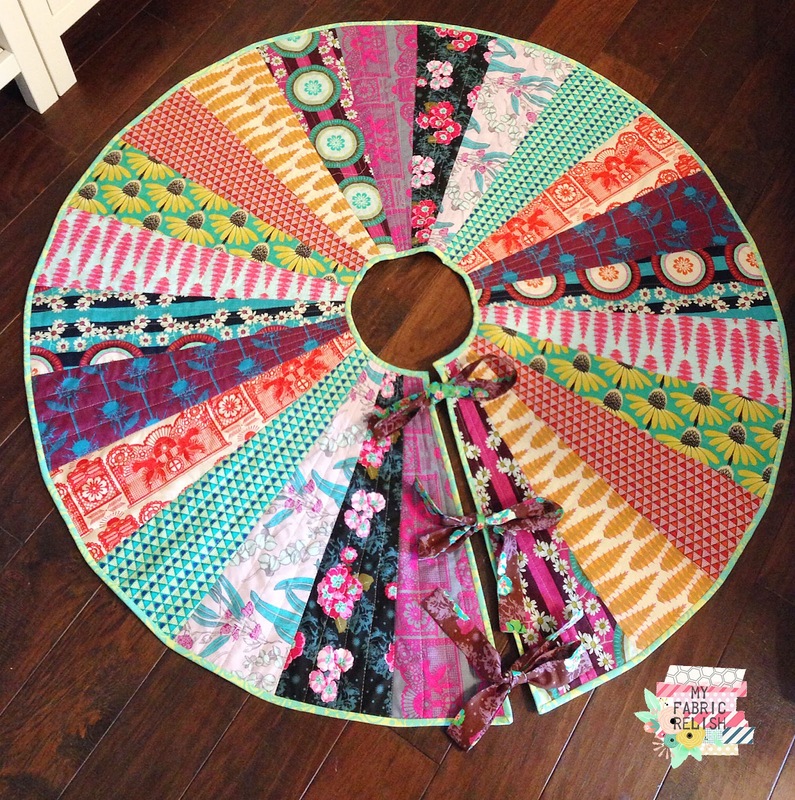 I am new to sewing and have been searching like crazy for blogs that give me inspiration. Happy Birthday Melissa! The cover you made for your machine is gorgeous! 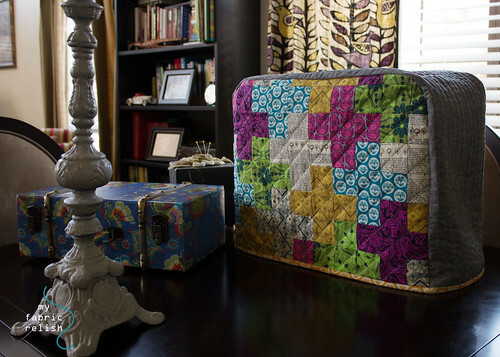 I love the patchwork, the pockets, the embroidery, everything! Have fun with your new BFF. It looks like a machine worthy of your talent! And thanks for the generous giveaway! Bloglovin is sleeping on the couch tonight!